Rebecca has performed and recorded internationally with a diverse range of ensembles throughout Brazil, Argentina, Senegal, Europe and Australia including Melbourne’s International Women in Jazz Festival. Featured at the SF Jazz Center, the San Jose Jazz Festival, Yoshi’s San Francisco, and the Oakland Paramount Theatre, Rebecca has performed and recorded with world­class musicians including Airto Moreira, Grupo Falso Baiano, Jovino Santos Neto, Jason McGuire and Hermeto Pascoal and worked with great dancers including Rosangela Silvestre, Melissa Cruz and Clara Rodrigues. Her duo with Brazilian guitarist Ian Faquini is found on her album Brasiliense. 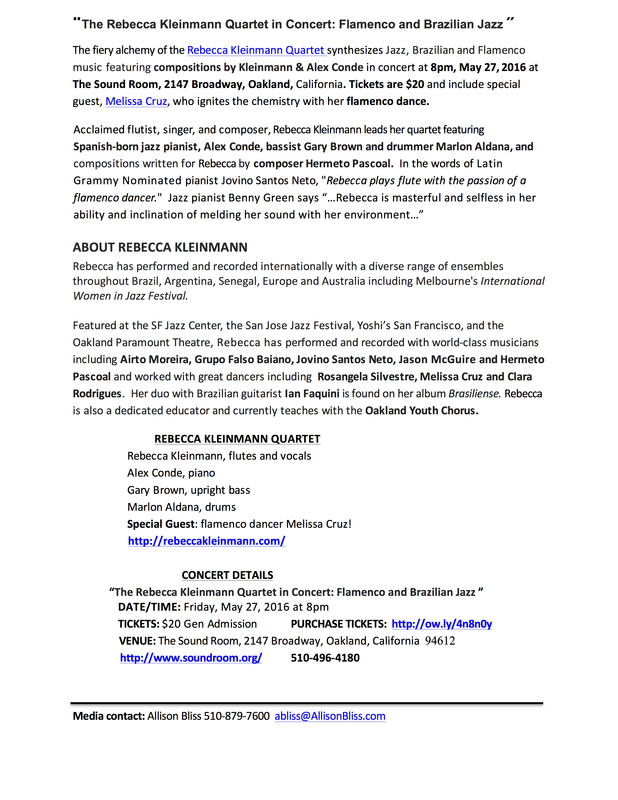 Rebecca is also a dedicated educator and currently teaches with the Oakland Youth Chorus. Special Guest: flamenco dancer Melissa Cruz!